Shark SGP-353037 3,000 PSI Review: Should You Buy Yay or Nay? This review looks at the Shark SGP-353037 Pressure Washer, and its strengths and weaknesses. It's a commercial-ready, heavy-duty model with a range of functions that will help you to tackle any large cleaning job. We’ve scored this washer highly for the above 4 categories, as there’s very little negative to say about its build or performance. Everything is steel-plated or reinforced by equally-durable components. A variety of lengths of warranty cover most parts for a reasonable timeframe. The pressure washer is easy to use, but the range of functionality increases complexity. Though this model is very expensive, you do get your money’s worth. The Shark SGP-353037 3,000 PSI is part of a series of washers produced by the Karcher Group, one of the leading brands within the pressure washer industry. Though Karcher produces a self-titled range of pressure washers in addition to these, the Shark units are designed for rigorous use in a very specific type of setting. Karcher also produce many compatible accessories, including oils for your engine and pump – essential for safe operation and longevity of your device – as well as a range of useful nozzles for different purposes. Shark units are manufactured using heavy-duty, durable components to withstand the most intense commercial environments. As a result, they are most suitable for the professional who is looking for a powerful and robust machine that will be able to handle prolonged periods of use, whilst also standing up to tough environmental conditions. This product is not for the casual user, who needs a pressure washer to hose down their decking or vehicle every few months. Karcher advises that your delivery service may struggle to transfer the machine from their van to your premises. The model comes with the required pump and hosing, as well as the heavy-duty and corrosion-resistant wand that can connect to a wide range of accessories. Nozzles are included, but additionally, the Shark SGP series pressure washer is compatible with more than 40,000 individual accessories, so you’ll never be short of replacements or additional functionality when you need it. Speaking of the physical design quality first, the machine comes with a heavy-duty, insulated gun with a fatigue-free handle, as well as 50 feet of wire-braided hosing. ​The reliable Honda-manufactured engine is perched on a rugged chassis built from steel, and painted for protection against all types of weather. This chassis is supported by 4 heavy-duty wheels. The inner workings of the machine also come in an impressive quality. The tires are foam-filled polyurethane for all-terrain maneuverability, and the wand is plated with steel for durability. The 6-gallon fuel tank is rust-free, and provides hours’ worth of continuous, uninterrupted operation. Enclosed within its own casing for protection lies a control panel, which gives access to a range of control and functionality, including an automatic thermostat for fine-tuning water temperature, and a burner on/off switch for activating the heater. The machine also packs in a safety thermal pump saver valve, which protects against temperature-related damage. 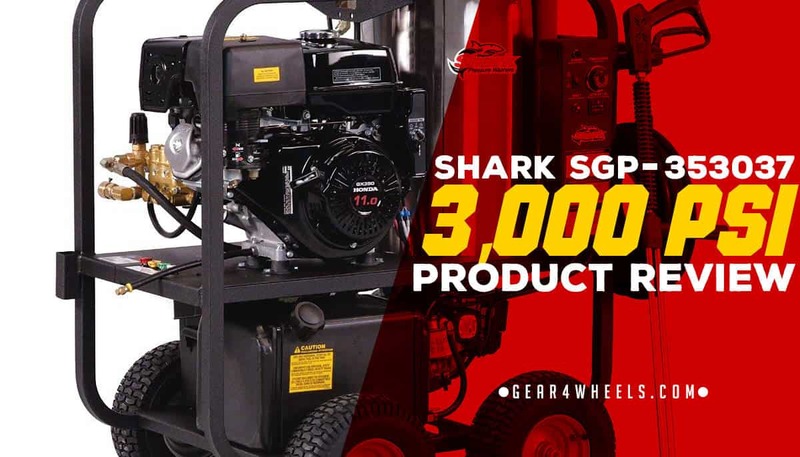 The Shark SGP-353037 Pressure Washer is a premium-tier washer from a reliable manufacturer that has been in the industry for some time. Karcher produces this range of units specifically for large-scale or commercial use. An extremely durable design is backed up by functionality that includes hot water compatibility, making a machine that is both heavy duty and ready for any cleaning task. Though not really suited to home use, and requiring a considerable amount of strength to move around easily, the machine still scores highly on all our categories. If you do decide to invest the money required to pick one of these up, you’ll have a machine that should last a lifetime, and a warranty that will protect you even if it doesn’t.